Objective The associations between oral diseases and increased risk of pancreatic cancer have been reported in several prospective cohort studies. In this study, we measured variations of salivary microbiota and evaluated their potential associations with pancreatic cancer and chronic pancreatitis. Methods This study was divided into three phases: (1) microbial profiling using the Human Oral Microbe Identification Microarray to investigate salivary microbiota variation between 10 resectable patients with pancreatic cancer and 10 matched healthy controls, (2) identification and verification of bacterial candidates by real-time quantitative PCR (qPCR) and (3) validation of bacterial candidates by qPCR on an independent cohort of 28 resectable pancreatic cancer, 28 matched healthy control and 27 chronic pancreatitis samples. Results Comprehensive comparison of the salivary microbiota between patients with pancreatic cancer and healthy control subjects revealed a significant variation of salivary microflora. Thirty-one bacterial species/clusters were increased in the saliva of patients with pancreatic cancer (n=10) in comparison to those of the healthy controls (n=10), whereas 25 bacterial species/clusters were decreased. Two out of six bacterial candidates (Neisseria elongata and Streptococcus mitis) were validated using the independent samples, showing significant variation (p<0.05, qPCR) between patients with pancreatic cancer and controls (n=56). Additionally, two bacteria (Granulicatella adiacens and S mitis) showed significant variation (p<0.05, qPCR) between chronic pancreatitis samples and controls (n=55). The combination of two bacterial biomarkers (N elongata and S mitis) yielded a receiver operating characteristic plot area under the curve value of 0.90 (95% CI 0.78 to 0.96, p<0.0001) with a 96.4% sensitivity and 82.1% specificity in distinguishing patients with pancreatic cancer from healthy subjects. Conclusions The authors observed associations between variations of patients' salivary microbiota with pancreatic cancer and chronic pancreatitis. This report also provides proof of salivary microbiota as an informative source for discovering non-invasive biomarkers of systemic diseases. Previous studies suggest a link between oral disease, especially periodontitis, and systemic disease, including pancreatic cancer. Chronic inflammation of the pancreas is associated with an increased risk of developing pancreatic cancer. Bacteria have been implicated in the pathogenesis of autoimmune pancreatitis and pancreatic ductal adenocarcinoma. First study showing how variation of oral microbiota diversity is associated with pancreatic cancer. Oral microbiota may function as non-invasive diagnostic biomarkers of pancreatic disease. How it might impact on clinical practice in the foreseeable future? Although unclear if the association is causative or reactive, this research may allow for intervention in altering the natural history of pancreatic cancer pathogenesis, especially in high-risk populations, through manipulation of the oral flora. The poor outcome associated with pancreatic cancer stems from its propensity to rapidly disseminate to the lymphatic system and distant organs.1–3 This aggressive biology, resistance to conventional and targeted therapeutic agents, and lack of biomarkers for early detection result in a 5-year survival rate of only 5% among patients diagnosed as having pancreatic cancer.4 5 Around 15%–20% of patients have surgically resectable disease at the time of presentation, but only around 20% of these survive to 5 years.3 Cigarette smoking is considered to be the only established modifiable risk factor for cancer of the pancreas, although some data also suggest an association of diabetes, obesity and insulin resistance with increased risk of developing pancreatic cancer. Additionally, the association of chronic pancreatitis with an extremely high risk of pancreatic cancer suggests that inflammation may be involved in the initiation and/or promotion of pancreatic cancer. Inflammation may enhance cellular proliferation and mutagenesis, reduce adaptation to oxidative stress, promote angiogenesis, inhibit apoptosis and increase secretion of inflammatory mediators. In this study, we performed a comprehensive comparison of the oral microbiota in human saliva from healthy control subjects and patients with either pancreatic cancer or chronic pancreatitis using HOMIM array and quantitative real-time PCR (qPCR). Furthermore, we evaluated the performance and potential translational utilities of salivary microbial signatures as an additional biomarker source for non-invasive detection of pancreatic cancer. This study was approved by the UCLA Institutional Review Board. The study design followed the principle of PRoBE design (prospective specimen collection before outcome ascertainment and retrospective blinded evaluation).30 All subjects were recruited from the UCLA Medical Center prospectively. The saliva bank of pancreatic diseases at the UCLA Dental Research Institute had collected 283 saliva samples. Of these, 103 saliva pellet samples, including 38 pancreatic cancer, 38 matched healthy control and 27 chronic pancreatitis samples, were selected for the discovery and validation phase of this study. Inclusion criteria of disease patients consisted of confirmed diagnosis of pancreatic cancer confined to the pancreas, either resectable or borderline resectable (due to superior mesenteric vein or portal vein involvement), and chronic pancreatitis. Exclusion criteria included evidence of locally advanced pancreatic cancer due to arterial involvement or direct extension into adjacent organs, metastatic pancreatic cancer, chemotherapy or radiation therapy prior to saliva collection and a diagnosis of other malignancies within 5 years from the time of saliva collection. Written informed consents and questionnaire data sheets were obtained from all patients who agreed to serve as saliva donors. The information on individual characteristics, such as age, gender, ethnicity, smoking and drinking history (current or past), is presented in table 1. Healthy control individuals were matched for age, gender and ethnicity to the cancer group. Unstimulated saliva samples were consistently collected, stabilised and preserved as previously described.31 The sample pellets were preserved at −80°C prior to assay. This study consisted of a discovery phase and a verification phase, followed by an independent validation phase. The salivary microflora in the pellet samples from 10 patients with pancreatic cancer and 10 healthy control subjects were profiled using the HOMIM array.32 Biomarkers identified from the microarray study were first verified using qPCR on the discovery sample set (10 cancers and 10 healthy controls). An independent sample set, including 28 patients with pancreatic cancer, 28 matched healthy controls and 27 patients with chronic pancreatitis, was used for the biomarker validation phase (figure 1). The validated biomarkers were evaluated within three levels of clinical discrimination categories: pancreatic cancer versus healthy control, pancreatic cancer versus chronic pancreatitis and pancreatic cancer versus combined non-cancer (healthy control + chronic pancreatitis). The purpose of including the patients with chronic pancreatitis in the validation is to evaluate whether the discovered biomarkers can also differentiate patients with cancer from patients with chronic pancreatitis, which has phenotypic overlap with early pancreatic cancer. 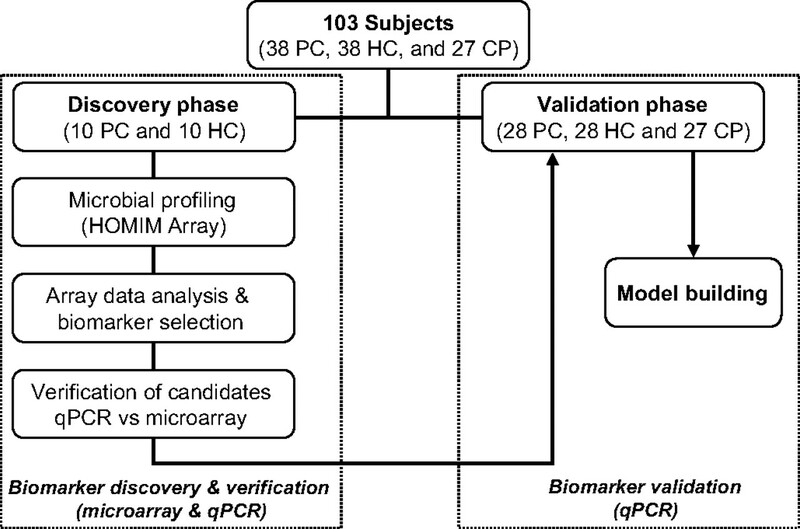 Schematic of the strategy used for the discovery (including verification) and validation of salivary bacterial biomarkers. PC, pancreatic cancer; HC, healthy control; CP, chronic pancreatitis. Bacterial DNA was extracted using the UltraClean Microbial DNA Isolation Kit (MO BIO Laboratories Inc, Carlsbad, California, USA). PCR amplification was performed using 16S universal primers (forward primer, 5′-GAG AGT TTG ATY MTG GCT CAG-3′; reverse primer, 5′-GAA GGA GGT GWT CCA RCC GCA-3′),33 followed by hybridisation to HOMIM array.32 Selection of bacterial candidates was based on Present detection call and p value by Mann–Whitney U test (P call ≥20%, p<0.05). Quantities of bacterial species in the original DNA samples were determined by qPCR. Specific primers were designed for the 16S rRNA genes of the bacterial biomarker candidates (table 2). qPCR was carried out in duplicate in reaction volumes of 10 μl using power SYBR-Green Master Mix (Applied Biosystems, Foster City, California, USA) for 15 min at 95°C for initial denaturing, followed by 40 cycles of 95°C for 30 s and 60°C for 30 s in the ABI 7900HT Fast Real Time PCR system (Applied Biosystems). Verified microbial biomarkers were then subjected to independent validation by qPCR using the validation samples. Out of 410 oligonucleotide probes on HOMIM, 149 probes targeting different species or higher taxa showed detectable signals after hybridisation. In all, 56 predominant species or clusters were defined as showing a mean signal intensity >10% of the positive control signal (16S rRNA universal probe on the HOMIM array), of which 31 species/clusters were increased in the saliva pellets of patients with pancreatic cancer (n=10) in comparison to those of the healthy controls (n=10), whereas 25 species/clusters were decreased. Predominant species/clusters detected in the saliva pellets belonged to five different bacterial phyla, namely, the Firmicutes (eg, Streptococcus and Granulicatella), Proteobacteria (eg, Campylobacter and Neisseria), CFB group bacteria (eg, Prevotella and Porphyromonas) and Actinobacteria (eg, Atopobium and Rothia). 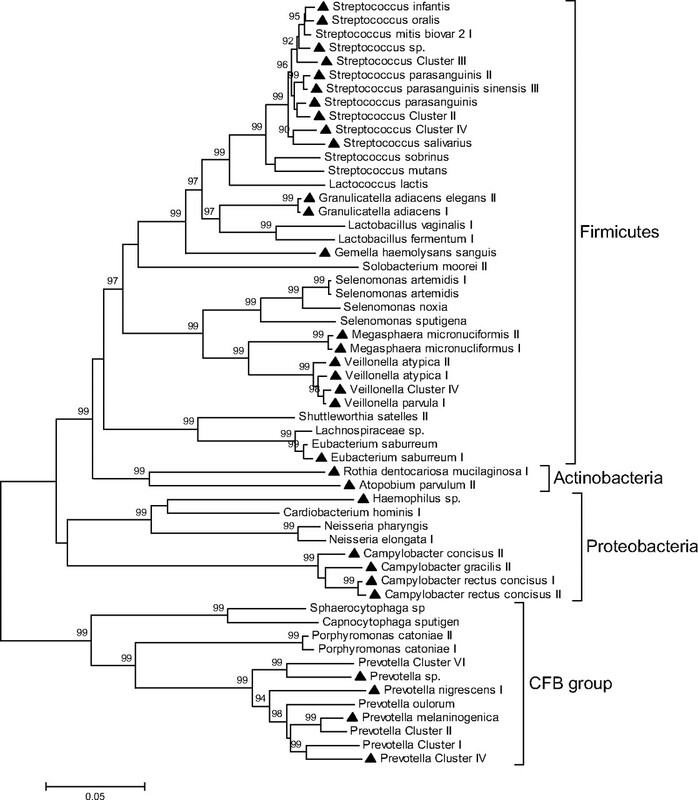 Firmicutes was the most diverse phylum, comprising 34 different genus/clusters, and Streptococcus was the most diverse genus, comprising 13 different species/groups (figure 2). 16S rRNA gene-based phylogenetic tree of 56 varied clusters/genera between patients with pancreatic cancer and healthy controls. Thirty-one clusters/species increased in the saliva of pancreatic cancer patients were marked with triangles. The phylogenetic tree was inferred by a minimum evolution analysis of 16S rRNA sequences. Based on the HOMIM data, 16 species/clusters showing significant difference between pancreatic cancer and matched healthy controls (p<0.05, n=20; mean signal intensity >20% of the positive control signal) were selected as biomarker candidates. These 16 species/clusters represented six different genera, including Streptococcus (3 species/groups), Prevotella (4 species/groups), Campylobacter (4 species/groups), Granulicatella (2 species), Atopobium (1 species) and Neisseria (2 species). qPCR was performed to verify the HOMIM array results. Using the original sample set of 10 pancreatic cancer samples and 10 matched healthy controls, 6 out of 16 species were confirmed by qPCR. All six microbial biomarker candidates showed significant differences between patients with pancreatic cancer and healthy controls (p<0.05, n=20). These candidates were then subjected to independent validation by qPCR (28 pancreatic cancer, 28 matched healthy controls and 27 chronic pancreatitis). Two microbial biomarkers (N elongata and S mitis) showed significant difference between patients with pancreatic cancer and healthy controls (p<0.05, n=56), yielding ROC-plot AUC values of 0.657 and 0.680, respectively (table 3). The levels of both bacterial markers were decreased in pancreatic cancer as shown by the results of qPCR, which were consistent with the results obtained by HOMIM array. 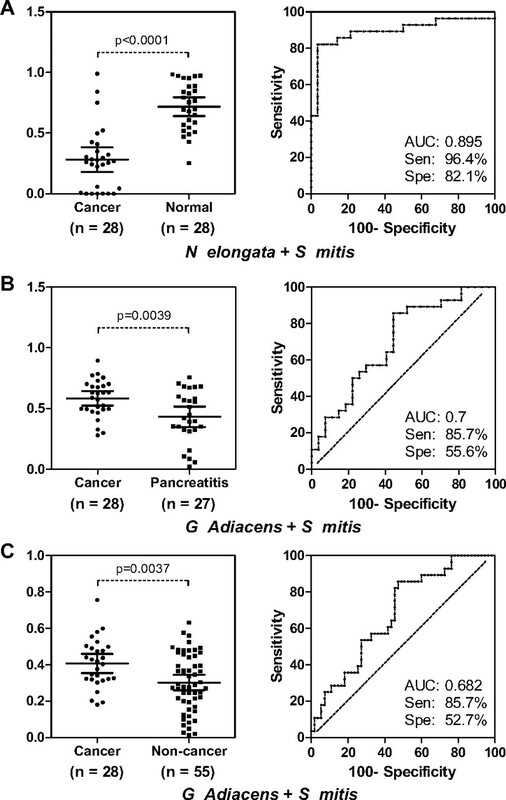 Interestingly, the levels of one increased species (G adiacens) and one decreased species (S mitis) were significantly different between pancreatic cancer and chronic pancreatitis (p<0.05, n=55). The levels of G adiacens and S mitis were also significantly different between pancreatic cancer (n=28) and non-cancer subjects (chronic pancreatitis and healthy controls, n=55) (p<0.05) (table 3). Logistic regression was used to evaluate different combinations of two biomarkers for three levels of clinical discrimination: pancreatic cancer versus healthy control, pancreatic cancer versus chronic pancreatitis and pancreatic cancer versus non-cancer (healthy control + chronic pancreatitis). For pancreatic cancer versus healthy control, the combination of two microbial biomarkers (N elongata and S mitis) yielded an ROC-plot AUC value of 0.90 (95% CI 0.78 to 0.96, p<0.0001) with 96.4% sensitivity and 82.1% specificity in distinguishing patients with pancreatic cancer from healthy subjects (figure 3A). For pancreatic cancer versus chronic pancreatitis, the combination of two microbial biomarkers (G adiacens and S mitis) yielded an ROC-plot AUC value of 0.70 (95% CI 0.56 to 0.81, p=0.0047) with 85.7% sensitivity and 55.6% specificity in distinguishing patients with pancreatic cancer from healthy subjects (figure 3B). For the discrimination of pancreatic cancer versus non-cancer, the combination of the same two microbial biomarkers as pancreatic cancer versus chronic pancreatitis (G adiacens and S mitis) yielded an ROC-plot AUC value of 0.68 (95% CI 0.57 to 0.78, p=0.0063) with 85.7% sensitivity and 52.7% specificity (figure 3C). Interactive dot diagram analysis and receiver operating characteristic (ROC) curve analysis for the predictive power of combined salivary bacterial biomarkers. The validated biomarkers were evaluated by logistic regression within three levels of clinical discrimination categories: pancreatic cancer versus healthy control (A), pancreatic cancer versus chronic pancreatitis (B) and pancreatic cancer versus non-cancer (healthy control + chronic pancreatitis) (C). The sensitivity and specificity for each model were obtained by identifying the cut-off point in the predicted probabilities from the logistic regression that maximised the sum of the sensitivity plus specificity. In general, these cut-off points correspond well with the proportion of patients with cancer evaluated in each model. Our study is among the first systematic surveys profiling the microbiome in saliva samples of patients with pancreatic cancer or chronic pancreatitis. We applied the HOMIM array profiling technology to assess salivary microflora alterations in pancreatic cancer and chronic pancreatitis, and possible discriminatory salivary microbial biomarkers that can be validated for these systemic diseases. By addressing both questions, our profiling results and further prevalidation of detection biomarkers open new research directions supporting the idea of systemic inflammation contributing to pancreatic diseases and that saliva is a scientifically feasible and credible biomarker source for non-oral diseases. The early detection of cancer can significantly improve survival rates, especially for pancreatic cancer which, unlike some cancers such as colon cancer, has no clear symptoms or screening methods. Cancer detection tools need to be sufficiently non-invasive and inexpensive to allow widespread applicability. The harnessing of valuable disease-specific biomarkers using less invasive methods such as salivary microflora alterations supports this concept. Taken together, these data suggest that the association between variations in oral microbiota and pancreatic disease may likely be causative rather than reactive. However, this study does not explore changes in oral flora after the surgical resection of pancreatic cancer to address this question. Whether and how local oral infection without bacteria entering the blood stream could potentially result in systemic diseases such as chronic inflammation or neoplasia are currently under active investigation. For example, the immune system recognises the presence of bacterial pathogens through the expression of a family of membrane receptors known as Toll-like receptors (TLRs). Lipopolysaccharide (LPS) on bacteria is specifically recognised by TLR4. Recognition of microbial components by TLRs initiates signal transduction pathways, which upregulate genes involved in innate immune responses and further instruct development of antigen-specific acquired immunity. These pathways are further regulated by TLR domain-containing adaptors such as TIRAP/Mal, TRIF, TRAM and MyD88. Screening for pancreatic cancer carries two major challenges. First is the need to detect early small pancreatic cancers confined to the pancreas or even precancerous stages, also known as PanIN stages. The second is in the ability to differentiate pancreatic cancer from the phenotypically similar chronic pancreatitis, a benign pancreatic disease. The determination of specific profiles of microflora changes in specific cancer types is important because it is possible that the different cancers may have overlapping signatures. We have evaluated the specificity of the validated microbial biomarkers against another HOMIM profiling study that had been performed in our laboratory using lung cancer. None of the bacterial biomarkers validated in this study was significantly altered in the microflora profile of lung cancer. This cross-disease comparison indicated that the validated microbial biomarkers in saliva are likely to be specific for pancreatic cancer detection. This is a discovery study with an initial validation of the statistically significant markers. Hence, in the absence of developing and testing of a prediction panel, this is a prevalidation study, and the biomarker model will need to be tested in an independent clinically relevant cohort in order to be ‘validated’. This study has some limitations. Primarily, the cross-sectional nature of the study does not enable us to understand the mechanisms and time sequence of the associations. Additional large cohort studies are needed to establish the time sequence and evaluate changes in the oral microbiome from early to later stages of pancreatic cancer. Furthermore, the small sample size does not allow for subgroup analysis to assess whether the associations are consistent across different populations defined by factors such as race, ethnicity and smoking status. For example, none of the patients in our discovery group and very few of the patients in our validation group had a history of smoking. However, smoking is clearly a risk factor for pancreatic cancer, and cigarettes themselves may represent a source for exposure to a wide range of potentially pathogenic microbes.68 However, this does not detract from the potential value of these markers for diagnostic testing, which is currently being evaluated in a nested, case-controlled study using a population-based cohort. We thank Ali Ammar for collecting and processing saliva samples. We also thank Susan Boches for technical assistance.
. Inflammation and cancer V. Chronic pancreatitis and pancreatic cancer. Am J Physiol Gastrointest Liver Physiol 2004;287:G315–19.
. Cancer statistics, 2008. CA Cancer J Clin 2008;58:71–96.
. SEER cancer statistics review, 1975–2005, National Cancer Institute. Bethesda, MD: SEER data submission, posted to the SEER website, 2008. based on November 2007. http://seer.cancer.gov/csr/1975_2005/.
. Defining the normal bacterial flora of the oral cavity. J Clin Microbiol 2005;43:5721–32.
. A prospective study of periodontal disease and pancreatic cancer in US male health professionals. J Natl Cancer Inst 2007;99:171–5.
. An exploration of the periodontitis-cancer association. Ann Epidemiol 2003;13:312–16.
. Tooth loss, pancreatic cancer, and Helicobacter pylori. Am J Clin Nutr 2003;78:176–81.
. Possible explanations for the tooth loss and cardiovascular disease relationship. Ann Periodontol 1998;3:175–83.
. Oral health, atherosclerosis, and cardiovascular disease. Crit Rev Oral Biol Med 2004;15:403–13.
. Periodontal disease and risk of fatal coronary heart and cerebrovascular diseases. J Cardiovasc Risk 1999;6:7–11.
. Preterm birth and periodontal disease. N Engl J Med 2006;355:1925–7.
. A review of the relationship between tooth loss, periodontal disease, and cancer. Cancer Causes Control 2008;19:895–907.
. H pylori infection causes chronic pancreatitis in Mongolian gerbils. World J Gastroenterol 2007;13:3939–47.
. Challenge in the pathogenesis of autoimmune pancreatitis: potential role of Helicobacter pylori infection via molecular mimicry. Gastroenterology 2007;133:368–9.
. Autoimmune pancreatitis, Helicobacter pylori infection, and apoptosis: a proposed relationship. Pancreas 2005;30:192–3.
. A concept on the role of Helicobacter pylori infection in autoimmune pancreatitis. J Cell Mol Med 2005;9:196–207.
. Helicobacter pylori and autoimmune pancreatitis: role of carbonic anhydrase via molecular mimicry? J Cell Mol Med 2005;9:741–4.
. Re: Helicobacter pylori seropositivity as a risk factor for pancreatic cancer. J Natl Cancer Inst 2002;94:632–3.
. Helicobacter species ribosomal DNA in the pancreas, stomach and duodenum of pancreatic cancer patients. World J Gastroenterol 2006;12:3038–43.
. Identification of a novel antibody associated with autoimmune pancreatitis. N Engl J Med 2009;361:2135–42.
. ABO blood group, Helicobacter pylori seropositivity, and risk of pancreatic cancer: a case–control study. J Natl Cancer Inst 2010;102:502–5.
. Helicobacter pylori seropositivity as a risk factor for pancreatic cancer. J Natl Cancer Inst 2001;93:937–41.
. Helicobacter pylori infection and development of pancreatic cancer. Cancer Epidemiol Biomarkers Prev 2008;17:1188–94.
. A prospective study of Helicobacter pylori in relation to the risk for pancreatic cancer. BMC Cancer 2008;8:321.
. The effect of eradication therapy for Helicobacter infection on the incidence of gastric and other cancers. Helicobacter 2004;9:534.
. Antibodies to Helicobacter bilis in patients with pancreatic carcinoma. Helicobacter 2004;9:538–9.
. Novel microarray design strategy to study complex bacterial communities. Appl Environ Microbiol 2008;74:1876–85.
. Pivotal evaluation of the accuracy of a biomarker used for classification or prediction: standards for study design. J Natl Cancer Inst 2008;100:1432–8.
. Salivary transcriptomic biomarkers for detection of resectable pancreatic cancer. Gastroenterology 2010;138:949–57.e1-7.
. Microarray analysis of the microflora of root caries in elderly. Eur J Clin Microbiol Infect Dis 2009;28:509–17.
. Bacterial diversity in human subgingival plaque. J Bacteriol 2001;183:3770–83.
. The meaning and use of the area under a receiver operating characteristic (ROC) curve. Radiology 1982;143:29–36.
. Receiver-operating characteristic (ROC) plots: a fundamental evaluation tool in clinical medicine. Clin Chem 1993;39:561–77.
. Dental plaque, platelets, and cardiovascular diseases. Ann Periodontol 1998;3:151–60.
. Salivary Actinomyces naeslundii genospecies 2 and Lactobacillus casei levels predict pregnancy outcomes. J Periodontol 2005;76:171–7.
. Chlamydia pneumoniae infection and the risk of female early-onset lung cancer. Int J Cancer 2003;107:681–2.
. Carcinogenic properties of proteins with pro-inflammatory activity from Streptococcus infantarius (formerly S bovis). Carcinogenesis 2004;25:1477–84.
. Association of Streptococcus bovis bacteremia with colonic neoplasia and extracolonic malignancy. Arch Surg 2004;139:760–5.
. An association between chronic infection with Chlamydia pneumoniae and lung cancer. A prospective 2-year study. APMIS 2001;109:572–80.
. Chlamydia pneumoniae infection and risk of lung cancer. Cancer Epidemiol Biomarkers Prev 2004;13:1624–30.
. Bacteria and cancer: cause, coincidence or cure? A review. J Transl Med 2006;4:14.
. The salivary microbiota as a diagnostic indicator of oral cancer: a descriptive, non-randomized study of cancer-free and oral squamous cell carcinoma subjects. J Transl Med 2005;3:27.
. Innate immune signaling and Porphyromonas gingivalis-accelerated atherosclerosis. J Dent Res 2006;85:106–21.
. Periodontal pathogens in atheromatous plaques isolated from patients with chronic periodontitis. J Periodontal Res 2006;41:350–3.
. Molecular detection of Treponema denticola and Porphyromonas gingivalis in carotid and aortic atheromatous plaques by FISH: report of two cases. J Med Microbiol 2005;54:93–6.
. Identification of periodontal pathogens in atheromatous plaques. J Periodontol 2000;71:1554–60.
. High serum antibody levels to Porphyromonas gingivalis predict myocardial infarction. Eur J Cardiovasc Prev Rehabil 2004;11:408–11.
. Antibodies to periodontal pathogens are associated with coronary heart disease. Arterioscler Thromb Vasc Biol 2003;23:1250–4.
. New bacterial species associated with chronic periodontitis. J Dent Res 2003;82:338–44.
. The bacteria of periodontal diseases. Periodontol 2000. 1994;5:66–77.
. Catonella morbi and Granulicatella adiacens: new species in endodontic infections. Oral Surg Oral Med Oral Pathol Oral Radiol Endod 2006;102:259–64.
. Association of an important Neisseria species, Neisseria elongata subsp. nitroreducens, with bacteremia, endocarditis, and osteomyelitis. J Clin Microbiol 1992;30:719–20.
. Granulicatella adiacens and Abiotrophia defectiva bacteraemia characterized by 16S rRNA gene sequencing. J Med Microbiol 2003;52:137–40.
. The influence of biosurfactants released by S. mitis BMS on the adhesion of pioneer strains and cariogenic bacteria. Biofouling 2004;20:261–7.
. Periodontitis is associated with a loss of colonization by Streptococcus sanguinis. J Med Microbiol 2008;57:495–9.
. Screening for early pancreatic neoplasia in high-risk individuals: a prospective controlled study. Clin Gastroenterol Hepatol 2006;4:766–81. quiz 665.
. Inflammation and cancer: back to Virchow? Lancet 2001;357:539–45.
. Nuclear factor-kappaB in cancer development and progression. Nature 2006;441:431–6.
. IKK/NF-kappaB signaling: balancing life and death—a new approach to cancer therapy. J Clin Invest 2005;115:2625–32.
. The nuclear factor-kappa B RelA transcription factor is constitutively activated in human pancreatic adenocarcinoma cells. Clin Cancer Res 1999;5:119–27.
. Nuclear factor-kappaB contributes to hedgehog signaling pathway activation through sonic hedgehog induction in pancreatic cancer. Cancer Res 2006;66:7041–9.
. Interleukin 1beta enhances invasive ability of gastric carcinoma through nuclear factor-kappaB activation. Clin Cancer Res 2004;10:1853–9.
. L1CAM-integrin interaction induces constitutive NF-kappaB activation in pancreatic adenocarcinoma cells by enhancing IL-1beta expression. Oncogene 2010;29:4766–78.
. Lipopolysaccharide increases cyclo-oxygenase-2 expression in a colon carcinoma cell line through nuclear factor-kappa B activation. Oncogene 2000;19:1225–31.
. Quantitative relationship between oral nitrate-reducing activity and the endogenous formation of N-nitrosoamino acids in humans. Food Chem Toxicol 1991;29:751–5.
. Human pathogens abundant in the bacterial metagenome of cigarettes. Environ Health Perspect 2010;118:351–6. Funding Funding support was provided by the National Institute of Health (RO1DE017170 and R21CA126733). Competing interests DTWW disclose ownership of intellectual property related to the saliva diagnostics field. The other authors disclosed no potential conflicts of interests. Ethics approval UCLA IRB Committee. This study was approved by the UCLA Institutional Review Board.